In some final over drama, Kyle Abbott was caught off a no ball with two runs to get off just two deliveries. The no ball from Eldred Hawkin was followed up with the single that gave the Heat their second win over the Spartans this season. 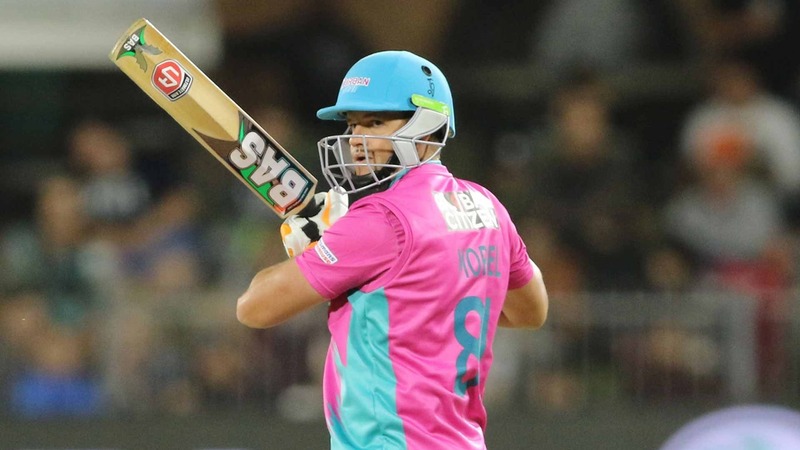 The Spartans started solidly with the bat and the openers Gihahn Cloete and Andrea Agathangelou took their side to 40 before the dangerous Rashid Khan picked up the first wicket. He bowled Agathangelou with a well disguised googly for 18 with the score on 40 in the sixth over of the clash. Keshav Maharaj continued to impress when he then bowled an advancing Cloete for 19 in the following over. Zimbabwean Sikander Raza also added 19 to the Spartans' total before Maharaj picked up his second wicket of the spell. Raza was caught by Kyle Abbott in the 12th over with the total on 80. The Spartans' two senior players, AB de Villiers and Eoin Morgan, than came together and took control of the game. Kyle Abbott was unfortunate to have AB de Villiers caught off a no ball and it cost the Heat as De Villiers played freely right up until the break. Of the 62 runs that they put together Morgan only added seven before he became Okuhle Cele's first Mzansi Super League victim. Tony de Zorzi joined De Villiers and scored 11, however the focus remained on De Villiers who continued to bat well. De Zorzi was LBW to Khan in the final over and Rory Kleinveldt was run out first ball. De Villiers' 93 not out off 52 deliveries helped his side to 188 for six in their 20 overs. The Heat spinners were the pick of the bowlers with Khan finishing with two for 25 in four overs and Maharaj two for 29 in his four overs. The chase never quite got off the ground to start with Morné van Wyk falling for six in the second over. Hashim Amla was unable to get off the mark, falling for a duck, with the score on nine. Weekend hero for the Heat Khaya Zondo was the next batsman to go, caught for two and then David Miller followed soon after for four. At the conclusion of the power play, the Heat were 28 for the loss of four wickets. SJ Erwee and Heinrich Klaasen tried to steer the Heat ship to safety and did a good job initially. The pair put on 40 before Erwee was LBW to one that kept a bit low for 30. Klaasen showed some good form with the bat and hit some lusty blows on his way to 36 from 26 balls before he was caught. At the loss of Klaasen for 36 the Heat were 98 for six in the 14th over still requiring 91 runs to win. Captain Morkel and Keshav Maharaj began the momentum shift with a partnership of 41 in three overs. Maharaj scored 23 off just 13 balls before he was bowled by a good yorker from Lutho Siphamla. Rashid Khan hit one big six, but fell soon after for six which brought Abbott to the crease. With 44 runs to get in just 20 deliveries Morkel took the game by the scruff of the neck. He went 50 and Abbott finished on seven not out to give their side a come-from-behind victory - their third of the tournament and second in a row.